Before the holiday break we discussed biostratigraphic organization, or the organization of geologic collections by stratigraphic, or temporal occurrence. This is the favored organizational scheme among most vertebrate paleontologists, particularly mammal workers. It serves to preserve the contextual nature of the geologic record. Here at the Museum of Geology we employ a third, very straightforward method of organization, numeric. Specimens are simply numbered in consecutive order as they’re cataloged. We’ve chosen this method for our mineral collection for a few reasons. Small portion of our mineral collection, a work in progress. The benefits to a numeric system are primarily in its intuitive nature; simply add numbers. Our mineral collections are currently being organized by Professor Emeritus Colin Paterson, who works with many work study students. A numerical system is easy to impart on his workforce which may change every semester. Additionally, a numerical system is reliable and stable. Arabic numbering hasn’t changed in awhile, and probably won’t anytime soon. Finally, accession of new material is a snap with a numeric system. Simply number, tag, and place in the collection. No space need be made within an existing systematic or biostratigraphic organization. Despite its simplicity, numeric organization does have its down sides. Within our mineral collection there is no underlying organizational scheme other than specimen numbers. Many mineral collections are organized by mineral type or chemical content (e.g. silicates); ours is not. Because of the lack of an over-arching organizational theme, a database is required to find specimens. If I’m interested in finding a nice specimen of tourmaline, it’s more difficult to peruse the collection if not organized by mineral type. I have to access the database to find the tourmaline specimens scattered throughout the collection. Some of our larger specimens. No, the gold nugget isn’t real (one of our most asked questions). Because there is no foundational organization, contextual data may also be lost with this organization. However, it is precisely to preserve some contextual data that we’ve also chose numeric organization for our mineral collection. The Black Hills was a mining hotspot for much of the late 19th and 20th centuries. Hundreds of small mines are located throughout the region. Many of our mineral collections were obtained from these mines which are now abandoned and forgotten. Our mineral collections may be the only tangible evidence of a mine’s existence. Thus, we’ve chosen numeric organization so we can keep minerals of varying types together based on provenance. The historical value of our mineral collection often outweighs any other uses. Of course, there is no “right way” to organize geologic collections; it’s all a matter of curator preference and collection usage. But it is important to examine the varying methods and delineate their benefits and shortcomings. Ultimately, collections organization should do one thing, facilitate efficient access and use. The efficiency depends greatly on the purpose for access and use, and organization should be chosen accordingly. Last week we discussed systematic organization of geologic collections, or organization via a Linnaean framework. This week, we’ll focus on what is probably the most favored organization scheme for vertebrate fossil collections, temporal or biostratigraphic. Biostratigraphy, of course, is the practice of dividing sediments into discrete packages based on their contained fossils. It’s a method by which we can observe floral and faunal change throughout the sedimentary record, and interpret change over time. Collections organized biostratigraphically are, quite simply, arranged by time, oldest (or stratigraphically lowest) first, followed by younger (or stratigraphically higher). This is an extremely intuitive method that has worked well for most collections accumulated and curated since the latter half of the 20th century. Many large vertebrate fossil collections, particularly mammals, are organized in this fashion, including the University of California Museum of Paleontology, the Los Angeles County Museum, and the University of Nebraska, Lincoln. Here at the Museum of Geology, our vertebrate paleontology collections are organized in this way. Section of collections containing the material from the Oligocene “Big Pig Dig” including the rhino Subhyracodon (top left) and the entelodont Archaeotherium (bottom left). Biostratigraphic collections are often organized via a “tiered” system. The overall organizational scheme is temporal. Within this scheme, material is generally organized by locality of origin (e.g. local fauna, geologic formation), and within locality by taxon. This system emphasizes its primary benefit, preservation of contextual data. Large and diverse collections from narrow stratigraphic levels are not dispersed, but retained, thereby preserving the association of specimens and taxa as they appeared in situ. Studies focusing on faunal diversity or palaeoecology are much more easily accomplished in biostratigraphic collections. Additional benefits to a biostratigraphic organization include its intuitive and more stable nature. While ongoing changes to the geologic time scale do occur, the overall ordering has remained stable for well over a century. It’s also a lot easier to explain the passage of time to a freshman work study or a new volunteer than it is to elucidate the intricacies of differing phylogenetic interpretations. As such, biostratigraphic organization is appealing to a broader work force. At the Museum of Geology, we’ve discovered an additional benefit to biostratigraphic organization; it is often accompanied by convenient separation of collections, most notably by federal agency. Because federal agencies are tasked with management of very specific resources, their fossil material is often restricted to specific geologic time periods. For example, most of our Cretaceous marine material was collected on US Army Corps of Engineers lands. Our Cretaceous terrestrial material is primarily from the US Forest Service. The bulk of our Oligocene White River holdings were acquired from Badlands National Park, and our early Miocene material is primarily derived from Ogallala Lakota tribal land. Finally, our Pleistocene material from central Oregon is the purview of the Bureau of Land Management. Biostratigraphic organization simultaneously divides our collections by federal agency, thus maximizing our effective repository efforts. Biostratigraphic organization does have its down sides. As mentioned above, taxonomic groups are split up. Anyone conducting phylogenetic studies will have to do a bit of legwork to gather the necessary specimens. Additionally, the emphasis on correct identification may be less with biostratigraphic collections. If organization is not dependent on accurate identification, then there is less need to spend additional time with precise diagnosis of specimens. The upshot to this, however, is that misidentified specimens are less commonly “lost” in biostratigraphic collections. If an important fossil is misidentified, most commonly as a fish or turtle, then that specimen may be forever misplaced within the “fish” section of a systematic collection. The appropriate squamate or bird expert may never see it, as they are not likely to spend time in other parts of the collection. However, in a biostratigraphic collection, experts will be exposed to everything from a given site, and misidentified specimens are more likely to be recognized and reported. Finally, biostratigraphic collections require a familiarity, and comfort, with local, regional, and often, continental geology. Most collections of this type I’ve visited arrange specimens, at some level, by formation. A working knowledge of the geology of your chosen time period (which any competent paleontologist should have) is imperative to orienting yourself in these collections. If your educational background does not include a geological emphasis, these collections can be challenging to navigate. Most geologically-oriented paleontologists prefer biostratigraphic organization. What’s your take? Next post, which will appear after the holidays, will discuss an additional organizational scheme. Until then, enjoy your break and, good luck on finals, or get those grades in! We have a late “What Is It Wednesday” entry this week, but this time we’re seeking your help. We’re not certain what we’re looking at this time. These specimens were recovered from the Chesapeake Bay area in 1994 by Laurie Anderson. They’re from the Rushmore Member of the Yorktown Formation, a Pliocene marine unit. The largest are approximately 14.0 mm in length. They’re boomerang-shaped overall, but cup inward on the concave side. They resemble tiny jai alai cestas. They appear to have grown concentrically as there are apparant growth lines on the convex surface. If you’ve seen something like this before or know what they are, please comment, as we’re stumped. It’s a touchy subject among natural history curators and museum professionals. How do you organize your collections? In this case, how do you organize your natural history collections of geologic materials such as fossils and minerals? Ask five different curators and you’re likely to get seven different answers, but everyone seems to have a pretty strong opinion on the subject. Many organizational schemes exist. Some work well; many, quite simply, do not. At the Museum of Geology we have several different collections, fossil vertebrates, fossil invertebrates, mineralogy, Recent osteology, and paleonbotany to name a few. We do not employ the same organizational scheme for each collection. In this series we’ll examine three of the most common organizational systems in geologic collections, each of which is employed in the Museum of Geology. These include systematic, biostratigaphic, and numeric organization. We’ll outline some of the pros and cons of each system. Many long-standing collections are organized via a Linnaean systematic framework. Hence, taxonomic groups are clustered together regardless of geologic age or geographic region of origin. Some of the most extensive collections, such as the Frick American Mammals collection at the American Museum of Natural History, as well as most collections of modern natural history specimens, are organized in this fashion. Systematic organization is a long-standing tradition in natural history institutions. At the Museum of Geology, our invertebrate paleontology and Recent osteology collections are organized via a systematic framework. These collections are primarily used for teaching, and organization by taxon most easily facilitates access for this purpose. All the scleractinian corals, all the Baculites, every specimen of Felis concolor are housed together in one area of collections space. Thus, anyone needing a specimen for teaching purposes knows precisely where to go to find it. All the kittens in one litter. The benefits of systematic identification are rather obvious, as outlined above. Entire taxonomic groups (e.g. Carnivora, Felidae) are contained in one region of collections space. As such, phylogenetic studies are much easier to facilitate, and evolutionary trends within groups are more directly observed and documented. If I’m concerned about the phylogenetic history of fossil Equidae, I need only spend my time in one portion of collections space. Additionally, because specimens require accurate identification to facilitate this type of organization, additional attention is devoted to accurately identifying material in this context. Systematic organization does have its down sides. When was the last time systematists agreed on a universal taxonomic scheme? Taxonomy and phylogeny are constantly changing in light of new discoveries and novel analytical techniques. As such, systematically organized collections may be in a constant state of flux, continuously shifting in response to changing views. I’d hate to have been the hypothetical collections manager whose job it was to move all Cetacea fossils from Mesonychia to Artiodactyla in the early 2000s. Additionally, accessing specimens in this context requires at least a working knowledge of the taxonomic system utilized in the organization. These systems sometimes rely on outdated taxonomy that contemporary researchers may not be familiar with. Additionally, getting student and volunteer workers up to speed on taxonomic interpretations can be challenging, limiting your effective work force. There is a much more problematic underlying issue with systematic organization with regard to many modern research themes. When specimens are organized by order, family, genus, and species, much of the contextual information gathered during acquisition can be obscured, or even lost. Fossil localities with high taxonomic diversity will be “split up” in the curation process, and a great deal of geologic, taphonomic, and ecologic data may not accompany the collection as a whole. Researchers working in a geologic or ecologic context will have to reconstruct this information from disparate parts of the collection. At best, this adds additional steps to the data collection process. At worst, data for timely studies of long-term change are lost. What is your opinion of systematic collections organization? Next post we’ll discuss biostratigraphic organization, which can address some of these issues, but does come with its own drawbacks. This week’s Volunteer Spotlight is on Gene Hess. Gene is the “guru” of all things database at the Museum of Geology. Gene initially set up our database in 2012 and has been single-handedly maintaining it ever since. Gene doing what he does best, and looking annoyed with being interrupted. Gene has an extensive background in museum studies. He obtained his undergraduate degree from the University of Delaware in Entomology and Applied Ecology in 1980. However, he began his museum experience even before that at the Delaware Museum of Natural History, working there from 1976 to 2007. He rose up the ranks from Collections Assistant, to Collections Manager, and for twelve years was Acting Chair of the Department of Ornithology. Gene focused his efforts at DMNH on most of the vertebrate collections, including mammals, reptiles, and fish. His greatest efforts were devoted to the ornithology collections, encompassing 120,000 specimens and housing the second largest egg collection in North America. Gene developed the original dBase digital database for DMNH for the two largest collections, ornithology and malacology. Gene put his time at DMNH to good use, culminating in the publication of Birds of Delaware, with co-authors Richard West, Maurice Barnhill, and Lorraine Fleming. Birds of Delaware is the result of almost fifteen years of work by Gene and co-authors. What began as a breeding atlas for Delaware birds became the foremost text on Delaware ornithology. The book encompasses a quarter million individual record points accumulated over three-hundred years (earliest records date to the 1600s). Gene spends his time these days on more modest, but no less important, work at the Museum of Geology. In addition to developing and maintaining our Specify database, he does considerable curatorial work in our invertebrate and Recent vertebrate collections, and also supervises and trains students. Gene’s favorite aspect of his job is that he gets to work in a museum, something he’s always wanted to do. He says his greatest challenges are constantly working out database bugs, and knowing some of the most optimal ways of utilizing Specify, but rarely finding opportunity to communicate these tricks to museum staff and students. When asked about his favorite fossil, Gene was hesitant as he’s spent most of his time working in the modern realm. After careful thought he enthusiastically declared Burgess Shale fossils to be “pretty cool”. High praise indeed from this soft-spoken yet dedicated professional. Thanks, Gene, for all your efforts. We’d be lost in the digital world without you. 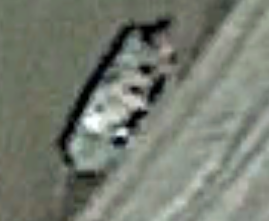 Sure enough, on closer inspection, our excavation was indeed documented on the most recent photo arrays in Google Earth. 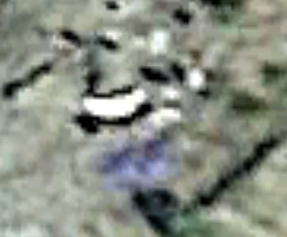 Because this excavation took place on public land, I can only reveal minimal portions of the imagery here, but I’ll include enough below to prove that this is, indeed, our excavation site. Our boat, used to access the site. At first this was pretty cool. What are the chances of our four day excavation project being captured by Google Earth photography? We now join the ranks of strange and wonderful things that can be found by virtually exploring our planet. We were even able to determine the date and approximate time the photos were taken. But, as I contemplate these events further, I’m becoming increasingly anxious about the whole thing. Despite my best efforts to maintain the security of the sites we access for our agency partners, this information is still available for all to see, however improbable it may be for someone to virtually stumble across it. Indeed, anyone can stumble across an ongoing excavation site on public land. Hikers, campers, hunters, fisherman, or geocachers, all have the potential to find specimens in the process of removal. But our images on Google Earth now mean that anyone sitting at their computers can get precise, georeferenced information about excavation activities that occurred within three months of today. The implications for the security of fossil sites are staggering. The potential for constructive use of this imagery is great, but so is the potential for poaching or vandalism. Large white spot in center is the jacket, blue spot is tarp covering backfill. Most of us see the immediate access to knowledge and current events the internet provides as a very good thing; most of the time it is. However, the ramifications of near real time imagery made publicly available have really hit home for me this afternoon. This is a work in progress. As time progresses we’ll add material, but we wanted to get a version up this month. Please feel free to provide feedback and critique; if there’s something you like, let us know. If there’s something you’d like to see, tell us.